Learn more about the Rhode Island Builders Association’s Member Rebate Program and see the growing list of participating manufacturers. 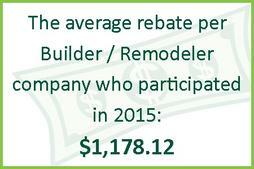 The member rebate program is only one of the growing list of RIBA Member Benefits. 92 Job openings in all firms supporting Residential Construction | Office-to-Jobsite and Sales-to-Management Positions Available | Apply NOW or Post a Job it’s FREE!